This small park features one of the nicest overlooks in DCNR’s Bureau of State Parks and is popular for hang gliding. Hyner Run State Park is nearby. 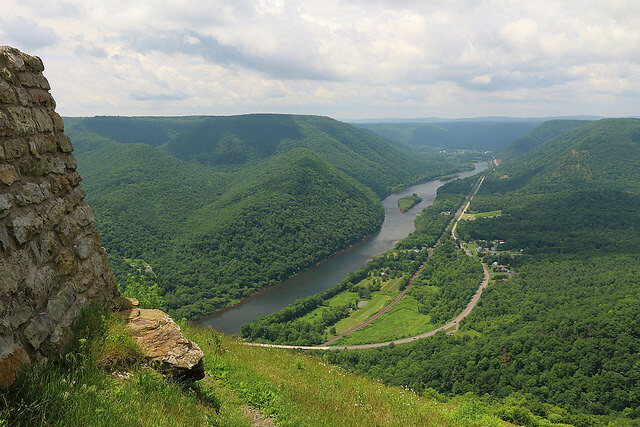 Hyner View State Park features a scenic vista and is a favorite spot for hang gliding. You can see vast distances both upstream and downstream over the West Branch of the Susquehanna River and surrounding mountains. Contact the Hyner Run State Park office for facility seasons and hours. The six acres of Hyner View State Park are in Chapman Township, Clinton County. From PA 120 at the village of Hyner, turn east onto Hyner Run Road (PA 1014) and travel for two miles, then turn right onto Hyner View Road. It is a five-mile drive to the view. From PA 44, turn west onto Hyner Mountain Road and travel for 5.2 miles. Just past the entrance to Hyner Run State Park turn left onto Hyner View Road. It is a five-mile drive to the view. This alternate route includes unpaved state forest roads. From PA 44, turn west on Hyner Mountain Road and travel for one mile. Turn left onto Ritchie Road. Travel for about two miles then turn right onto Old View Road. Travel for about three miles to the view.